I'll start it off by answering some of the most common questions we receive. Everyone, if I've missed any, please post any questions you get while you're riding that you think may interest someone who's just starting out. A. Yes, very fun. Most people will start having fun on skiboards almost immediately. Unlike with snowboarding and skiing which have a very steep learning curve. Q. Can you go fast? Q. What are snowblades and skiblades. A. Snowblades are an inferior brand of "skiboard" made by Salomon. Inferior because it's made with a foam core, uses cheap plastic bindings and does not use the industry standard 4x4 binding insert pattern that allows binding interchangeability and full flex of the skiboard. Only a ski made by Salomon can be called a snowblade because Salomon has trademarked this term. Skiblade is just another term for a snowblade. Skiboards on the other hand are 110cm and under, often twin tip, symmetrical, use wood cores and the universal 4cm x 4cm binding pattern(more on that later). Longboard skiboards are from 110cm to 130cm and use the 4cm x 10cm binding insert pattern allowing easy installation of Spruce risers and release bindings, which are optional on skiboards <= 110cm but required with all longboards. Q. Should I use poles? A. Please do not use polls. Polls are used to help turn big skis and take away from the freedom skiboards provide. Since skiboards are so short and parabolic all you need to do to get them to turn is put them on edge. Check out this forum post on the topic. Q. Can I use them in powder? A. Yes, but if you plan on riding in powder get wider, rockered skiboards made by companies like RVL8, Allz, SnowJam or Spruce. Also, there are certain techniques to riding skiboards in powder. 2. Stay on steep terrain. Like a snowboard, if you get caught in deep snow and the hill isn't steep you'll be stuck. 3. Head for the trees. One of the biggest thrills of skiboarding is riding powder through steep, dense trees...Nirvana! Q. Can I use regular ski boots? A. Yes, every skiboard binding we sell will work with regular ski boots except the soft boot bindings which use soft snowboarding boots. Q. Should I get skiboard specific boots. A. We don't know of any such thing. Skiboarding is a small industry and no company makes skiboard specific boots. Q. What features should I look for in boots for skiboarding? A. Comfort is number one. Second try to find boots that allow as much of an upright stance as possible. When skiboarding in variable snow conditions we need to lean back a bit to keep our tips up and if our boots force us in a forward position it causes premature leg muscle fatigue. A "freestyle" boot works great. Third, when a ski shop fits you for boots do not let them fit you so your toes are touching the front of the boots. We need a little room since we're leaning back otherwise our toes will be crushed. A. Yes but only with non release skiboard bindings. They won't work properly with release bindings as hard snowboarding boots are not DIN compatible. Q. Can I use soft snowboarding boots with skiboards? A. Snowboard bindings that use soft snowboard boots will screw into all the skiboards we sell that are 110cm or shorter (they all have the standard 4cm x 4cm binding insert pattern) however the bindings will be too close to the board so a riser will be needed. After extensive testing we've determined the best snowboard binding to use is the Snowjam / 540 modified or GGO. Both include winged highbacks, 3 straps and extremely sturdy risers. Without a riser, a rigid, winged highback and a 3rd strap (i.e. all regular snowboard bindings) carving will be nearly impossible. Q. 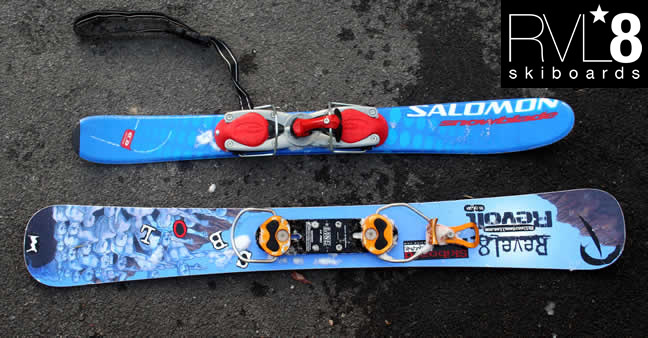 Can I screw regular ski bindings into the skiboards sold at SBOL? A. No, the skiboards sold at SBOL are all made with the universal 4x4 or 4x10 insert pattern and are not designed to have bindings screwed into their cores. Not only is it unsafe, the bindings screws could pull out, this configuration will stop most of the board from flexing, ruining the ride. And, skiboards made to accept direct mounting(drilled into wood core) need to be made stiffer with thicker core and metal plates which increase weight and decrease flex dramatically. It's for this reason Spruce created The Riser interface which allows release bindings to be used with all high quality 4x4 skiboards (see the question below "Are 4 hole skiboards (aka 4x4) better than 8?"). Q. Another retailer told me the Spruce Riser wasn't the best solution. Is this true? Q. Do skiboard bindings release? A. Some do, some do not. Examples of 4x4 non-release bindings are: Bomber Elite2, RVL8 Receptor, Zero Pro and Snowjam's Extreme II. The best releasable solution, and the only one we sell, is the Spruce Mountain Riser/Bindings. 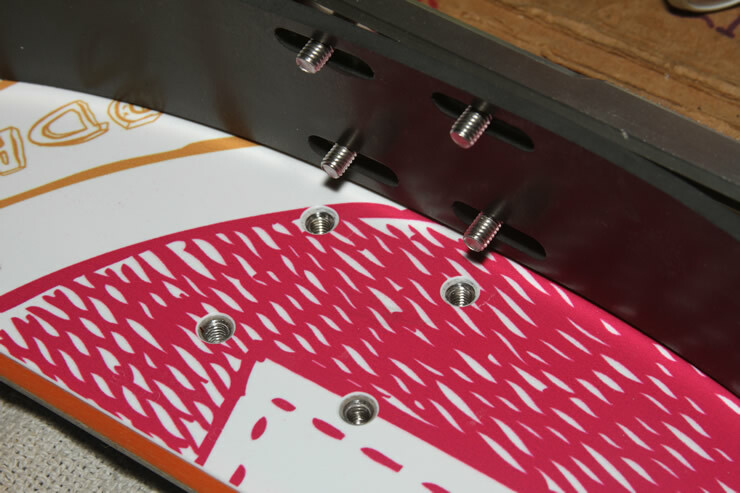 They use the universal 4cm x 4cm (and 4cm x 10cm for longboards) insert pattern and, because of the riser interface, allow more of the board to flex than any other release binding solution, by far. Note: Spruce and SBOL are authorized Head/Tyrolia dealers. Spruce and Head stand behind the Spruce riser system for mounting release bindings on skiboards. Spruce has sold thousands of their risers and they are regarded by the top skiboarders as the highest performance release binding system available for skiboards. Plus, The Spruce Riser/Binding combo comes with a 5yr warranty because they are so confident in their products. Q. Which are better, 4x4 non-release or 4x4 release bindings (Spruce risers/bindings)? A. As with most things there are pro's and con's to both. The decision is a personal one because the value each person places on each pro and con varies depending on the individual. - Higher height for increased carving leverage. Q. Are 4 hole skiboards (aka 4x4) better than 8? 1. 8 hole boards spread the contact area of the bindings over a larger area meaning less of the board can flex meaning the ride isn't as good, especially for carving. 2. Most companies that make boards with 8 hole inserts choose to use foam cores which come out super stiff, aren't as fun to ride, do not provide even, lasting or consistent flex and aren't as strong, which equals more potential for breakage. 3. No company makes replacement parts or replacement 8 hole bindings. Which means if you ever break an 8 hole binding you have to trash the whole setup and buy new bindings AND boards. And, since all 8 hole bindings are made of cheap plastic it's more likely they will break. 4. The universal 4 hole insert pattern is an industry standard and is used by ALL core skiboarding companies which means you can interchange any and all 4x4 bindings and boards and even upgrade your boards and/or bindings independently from each other. There really is no reason to buy foam core boards that use 8 hole plastic binding when you can buy high quality, wood core boards that use 4x4 all metal bindings for about the same price. Q. How should my boot fit into non-release bindings? from Skiboarders United on Vimeo. Q. How come I never see any skiboarders at my local mountain? A. Skiboarding was more popular and mainstream a few years ago when it was the "new" thing. This has been replaced by the new twintip ski craze. Many people on the mountain are just there because they want to fit into what society deems as cool. (why else would so many go through all the expense and trouble of getting snowboards and gear and then just sit in the terrain park all day). Skiboarding is not mainstream, you won't see 'Tony the Tiger' skiboarding on a box of Frosted Flakes. But, skiboarding is totally liberating, you're on the mountain doing what you love, going wherever you want, with total control and freedom. And all the "sheep" are looking at you and wondering "are those fun?" "It looks like he/she's having fun." "I would like to try it but my friends might make fun of me because I'll be different from them." Geez! Sorry, I got off on a tangent but what I'm trying to say is without any advertising or marketing skiboarding is still growing...how? by word of mouth from the people who love it. So get some skiboards and join us in being individuals. You won't regret it. Q. Do the boards come pre-waxed? A. Yes with a light coat of factory wax. This will be good to get you started but after that you should get them hot waxed every so often. How often depends on how much you ride, in what conditions and how fast you want to go. Many people do their own hot waxing to save money and give them the ability to have a fresh wax job every time they go out. To learn more about hot waxing visit this thread. To purchase waxing supplies click here. Q. Will Skiboardsonline.com attach my bindings? A. Yes, we install all bindings when ordered with skiboards - no additional charge. A. Shipping is based on your order's total weight so it varies greatly. Within the USA you have a number of different methods to choose from depending on how quickly you want to receive your order. Regardless of your location you can always determine your exact shipping cost by shopping in our store, entering items in your shopping cart, clicking checkout, entering your address info. Q. How long until my order arrives? A. In stock items are typically shipped in 24-36 hours. All products sold at SBOL ship from California except Spruce products, those ship from New Hampshire. When ordering you can choose FedEx home delivery, 3day, 2day or overnight shipping. If you're international we ship via USPS USPS 7 day or 14 day International Express Service, your choice. Q. Do I have to pay taxes or duties on my order? A. If you are within the USA you only have to pay sales tax if your order is shipping to New York State. All other states pay no sales tax. If you're international, duty/tax is imposed by your local Customs office. However, since we ship via www.usps.com taxes and duties are typically much less than if we ship with UPS or FEDEX. Last edited by Greco; 03-07-2018 at 06:21 PM. Well, I have to say this was a damn good idea. Thanks. Feel free to add to it. Props Greco. It's actually quite a shame to see all my old skiboarding buddies go to twin tips because everybody is doing it. My first skiboards were some soloman buzz snowblades :'( hehe, but they were just hand-me-downs from my bro when he got twin tips but they were recentally run over by a snowmobile, so now i have some line mike nick pros with canon td1 bindings. Cha-ching! Just a comment to this Q/A.......do the additional accessories fit any skiboard? Are there any comfortable skiboard boots on the market ? A. Not without some additional accessories. The best option right now is to add the Miller Releasable interface to your skiboards and then attach your snowboard bindings to it. Some good skiboard boots are Salomon Verse 4.0s or 550s, if you can find them (i ride 550s).....I heard some good things about Rossingnol Soft Lights too. You need a ski boot that puts you in an upright stance like skating unlike a forward lean stance normally used in skiing. Also hardshell snowboard boots are good to I hear, you can get them here at SBOL, but a bit pricy....I prefer softboots as they feel a lot better and are very comfy. There is a way to mount your snowboard bindings to a skiboard, but i wouldn't recommend it.....soft boots are the only boots i'd buy online mainly because they don't really need to be fitted and are a lot like skates in my opinion, but other than that go to your local ski shop and get fitted for some boots that put you in an upright position. Since this is the FAQ bit, I thought I'd just comment on how good a service I have had from SBOL- incase any of you, like me, wanted to buy some gear but were a bit reluctant to buy online. "1 out of every 10 adults suffers from alcoholism and 2 out of 5 teens 12-18 suffer the same". Is it still accurate to say that all true skiboards are 110cm and under? If life's not beautiful without the pain, well I'd just rather never ever even see beauty again. In short - no. While I have not been around long it is clear that the definition of what constitutes a skiboard is not as simple as how long it is. Jjue, Greco, Valmorel and others have given great explanations of what differentiates regular skis, twin tips and skiboards. Obviously, by definition skiboards are some type of ski but the differences are not mere semantics. It's about the way they are built, ridden, their behaviors and our entire outlook. I think even what the old timers see as a skiboard is in the process of changing. I do believe we are living innovative times. Hold onto your knickers. I think it's going to get interesting. I agree completely, and so was curious if perhaps the FAQ should be changed to reflect that. Not that it matters a ton, but if someone were to read that and take it as the final word, they'd be confused why a skiboard store like SBOL is selling spruce 120's and 130's. I see your point. Hmm. Greco?